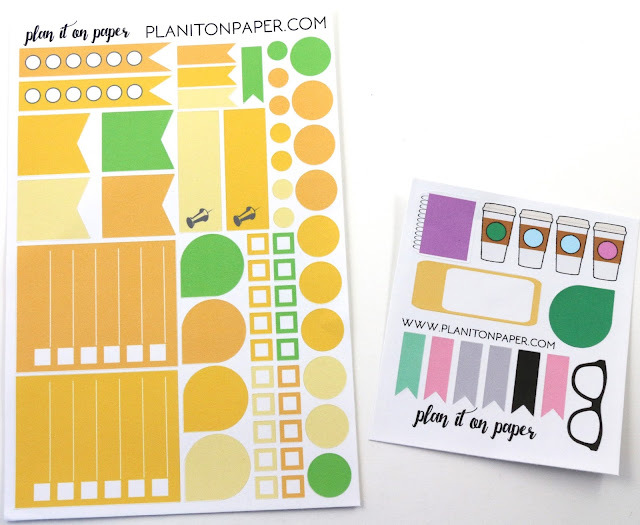 There were stickers from another shop this month, Plan It On Paper! The info card this month, which includes the values of each sticker sheet. 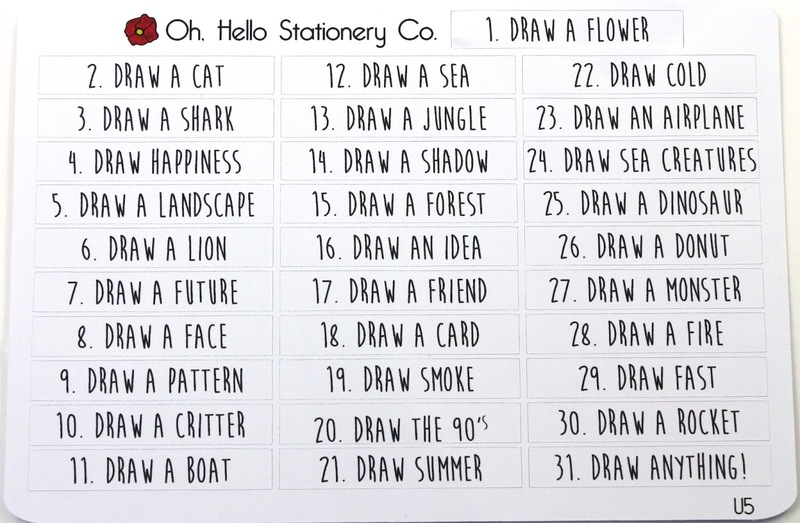 I like the idea of these, but some of them I just won't have a use for. I don't own a home, so I don't need to clean the gutters, but otherwise I think most of these I can get a use out of. I do wish there were more kinds with less of each, since most of these things get done only once a year, or maybe twice. 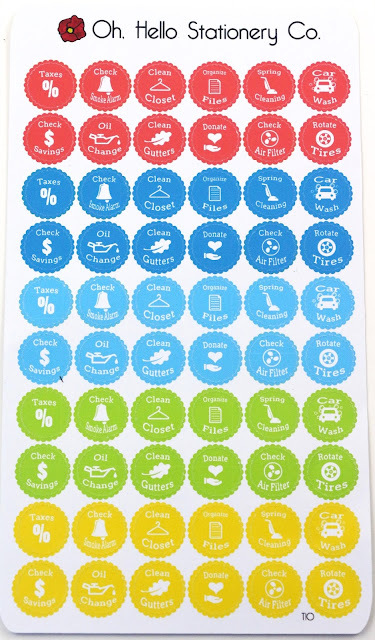 I'd rather be able to use up a sheet of stickers rather than have it sit in my storage for years. I'm going to be honest here, and I have absolutely no use for this sheet. I mean maybe I can cut out the words and use them for something else, but I don't even know anyone I could gift this to. It's an interesting idea, but I just don't think very many subscribers will use this. These are nice, full size boxes that I will definitely get some use out of. 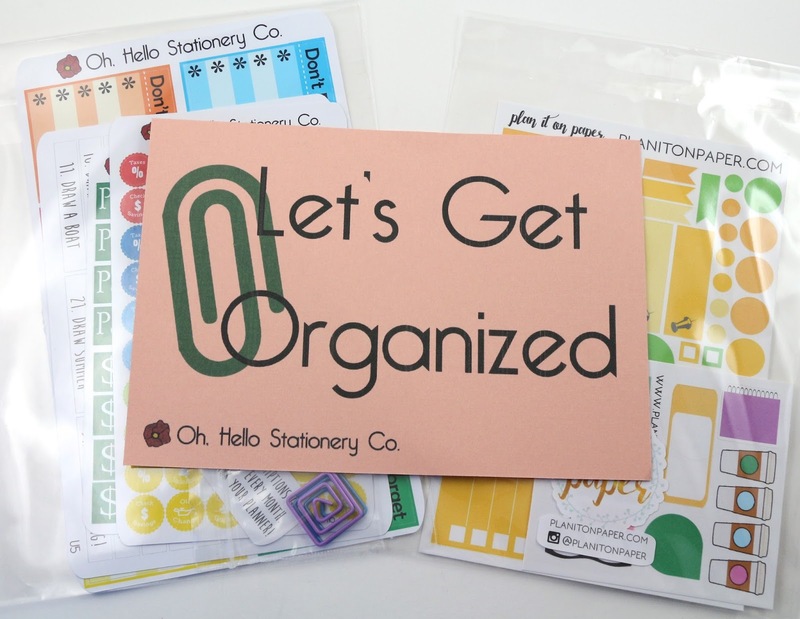 My one problem with Oh Hello's checklist sheets are that there are always words at the top that could be eliminated to make room for another check box. This set is ok, but I don't have much use for it currently. 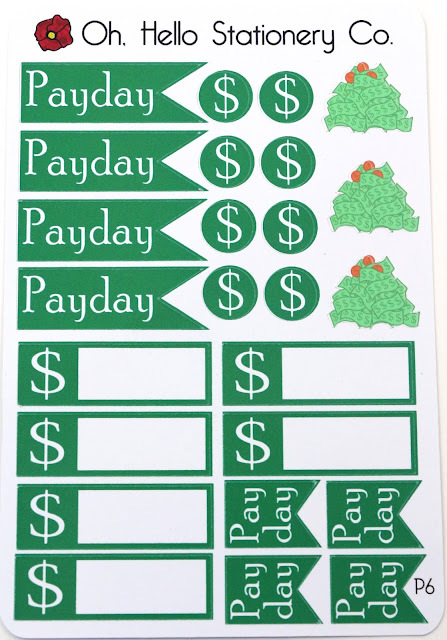 And the stacks of money have those weird red dots on the top, it just makes me think they look like Christmas trees. These are cute, I've been wanting some other kinds of clips for my planner. 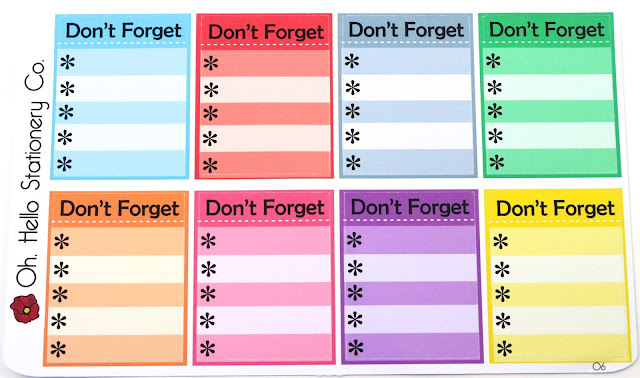 I like bookmarking the week with a coil clip marker I have, and then marking the day with a clip like these. I've never ordered from this shop before, but I like these sheets. I actually needed a few more August colored stickers to supplement the August kit I bought, and this was perfect. I do wish the little sampler had a bigger variety of her stickers on it, since there are a lot of coffee cups and flags on it. 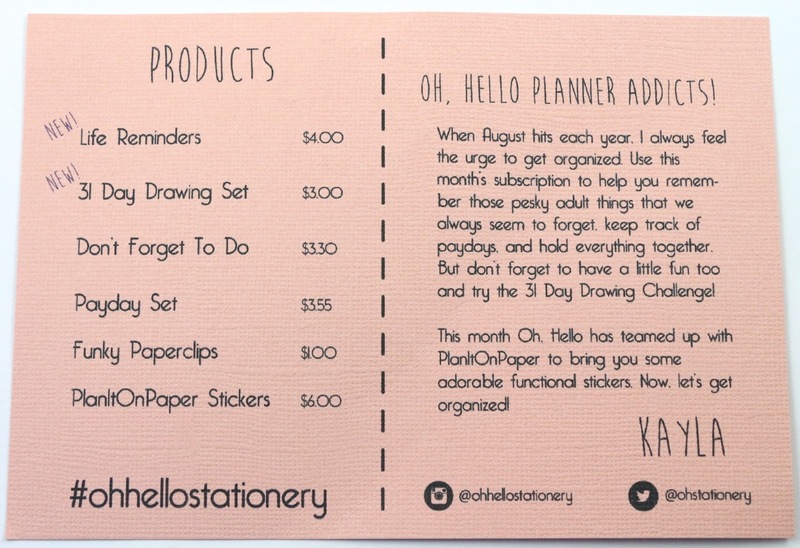 Overall, I thought the theme for this month's Oh Hello Stationery subscription was a great idea, but sort of fell flat for me. The value this month was $20.85, and the subscription costs $15/month, or $45 for three months. This month was a bit of a bummer for me, I don't have much use for the majority of the items. 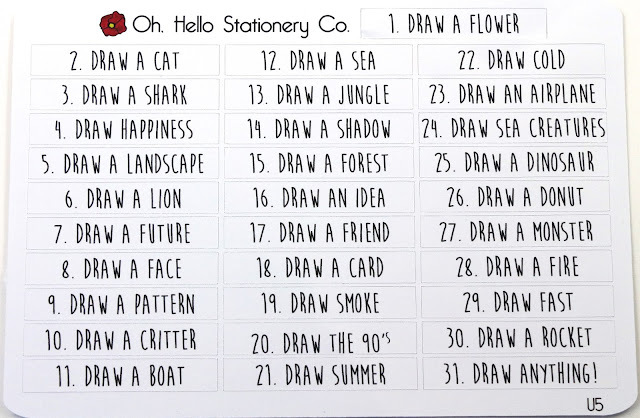 The drawing set challenge doesn't fit the theme, and is pretty much useless for me. My favorite item was actually the August kit from Plan It On Paper, because I really needed some of those to finish up planning August. We'll see what September has in store, but if it's another month like this I probably won't resubscribe.